It's become the fastest rising type of identity theft - taking on the mantle of the dead. It can be a recent bereavement or even the name of someone who died years before. In 2005 there were 70,000 cases in the U.K., costing an estimated £250 million, experts now predict the number of these sorts of crimes will very rapidly increase. But above the money is the distress it can cause the bereaved families. The criminals will search for a death notice in a newspaper, and then apply for a certificate of birth in the name of the deceased. British birth certificates contain no details of whether the named person is dead or alive. From just that piece of paper they can build up more information. It becomes relatively easy to discover where the person lived and all manner of details, enough to obtain the National Insurance number and a driving licence and acquire all the paperwork that allows the criminals to successfully apply for loans and credit cards, which are never repaid. The first the relatives of the dead know is when they receive a call about the unpaid bills. Another, even simpler, way is for the criminal to view the house of the deceased once it's put up for sale. All too often mail, such as credit card offers or even bank statements, is left lying around. It's the act of a moment to slide it into a pocket and begin taking over the identity. Why are the identities of dead people so desirable? For a start, it takes longer for anyone to discover there's even been a theft, giving the crooks more time to rack up bills. Secondly, many older people have spent their lives being scrupulous about money, which means that they have spotless financial histories, always making payments on time. therefore obtaining credit cards and loans in the deceaseds name becomes easier. Don't put a death notice in the newspaper. It becomes a magnet for criminals, and from the tiniest pieces of information they can piece together the identity of the dead. If you're selling a house of the deceased, make sure all personal information regarding the former owner is locked away. 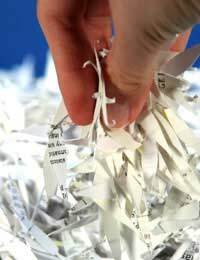 Remove and shred all mail before anyone views the house. Inform the Post Office of the death and have mail redirected to a relative. Inform the credit reference agencies of the death. This prevents anybody from taking out any loans and credit cards in the name of the deceased, or running up debts on stolen cards. Give the deceased's name to the United Kingdom Bereavement Register, an organisation that stops junk mail going to the deceased. Perhaps the most important thing is to be aware of the possibility of identity theft and remain vigilant. Its actually beneficial to order a credit file on the deceased after their death, and also six months later to see if there's been any activity. Quite probably the first thing you'll know about the identity theft will be when you recieve a telephone call from the bailiffs attempting to trace your father or mother or relative about an unpaid credit card bill. If that happens, contact the police. You'll need to have the death certificate with you, in order to prove the person is really dead. However, that will probably only be the start of your worries. If you're the next of kin (at least the next of kin in the same country) you might well have to prove that you haven't stolen the money or you'll be the one who is liable for the debt accured, and this might run into several thousand pounds. The sad part is that in trying to honour the dead and move on with your own life, you lay them open to have their identities stolen from beyond the grave. There are a number of highly organised gangs perpetrating this kind of scam, and all too often they're never caught.